The move-in from Wilmington made four three-pointers during a momentum seizing run in the first half and had a game-high 21 points to lead Bellbrook to a 46-34 win over Monroe Feb. 2 in a game that wasn’t as close as the final score may indicate. Zerby — who made more than two three-pointers one other time this season — sparked a 7-0 run in the final 1:06 of the first quarter with a three-pointer to help give the Golden Eagles a 14-7 lead, and then she hit three more in the first four minutes of the second quarter to give Bellbrook a 23-10 lead. As a non-starter, Zerby’s 12 first-half points were just one less than Monroe’s total as Bellbrook led 23-13 at halftime. Until she checked in, neither team led by more than two points. 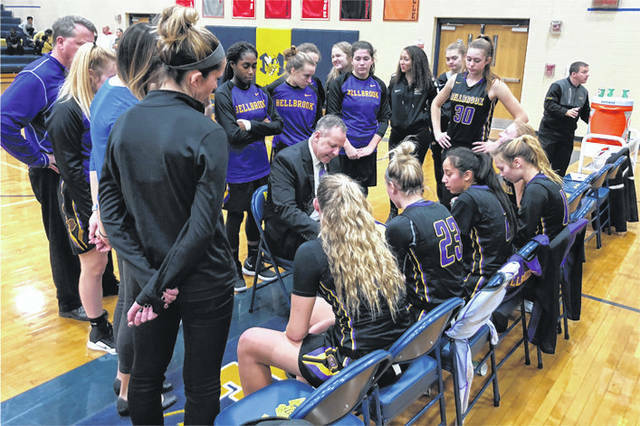 https://www.fairborndailyherald.com/wp-content/uploads/sites/50/2019/02/web1_Bellbrook-Time-Out_ne201922203144638-1.jpgScott Halasz | Greene County News Bellbrook High School girls basketball coach Jason Tincher draws up a play during a timeout Feb. 2 at Monroe High School. The Golden Eagles won, 46-34, behind 21 points from sophomore Bailey Zerby.